It is, to the institutions and ideals of England's old colonial empire, that one must ultimately look for the origin of the University of New Brunswick. The austere theology of the Puritans of Massachusetts was responsible for a seriousness of purpose that made in-depth education an integral aspect of their culture. Uprooted from their old homes by the American Revolution, the Loyalists brought the standards of Harvard and King's College, New York, with them to the New Brunswick wilderness. It was therefore natural that when they founded the Loyalist Province in 1784, they should have made provision for the education of their young people. At that time Lois Paine, wife of Harvard graduate [William Paine], wrote that she liked New Brunswick very much, but regretted that, in the prevailing circumstances of frontier life, her children could not be properly educated. In Council 13th December 1785 Present the Governor Mr. G. Ludlow Mr. Hazen Mr. Odell Took into consideration the memorial of Dr. Wm. Paine and others praying a Charter of Incorporation to be granted for the institution of a Provincial Academy of Arts and Sciences: Also a memorial of the principal Officers of disbanded Corps and other Inhabitants of the County of York praying that part of the reserved Lands round Fredericton may be appropriated to the use of the proposed Academy. Ordered That the Attorney and Solicitor General be directed with all convenient speed to prepare the draught of a Charter for the establishment of the said Institution. A "draft charter," modelled on that of King's College, New York, was drawn up in 1785, and at the same time about 6,000 acres of land in the parish of Fredericton were reserved for the use of the Provincial Academy of Arts and Sciences. In opening the Legislature in 1792, Governor Carleton urged that increased aid be given to the "Academical Establishment," and accordingly in 1793 the Assembly voted an annual sum not to exceed £200 for that purpose. Nor was the Academy lacking "in philosophical apparatus," for in the same year Carleton asked that the astronomical instruments used in establishing the boundary between Maine and New Brunswick be presented to the seminary "as a mark of His Majesty's gracious and potential favour." There would be erected without delay a "sufficient observatory for their reception" which would enable the college "to commence a course of observations to be regularly communicated to the Astronomer Royal at Greenwich." Thus at that early date was anticipated the present Observatory building, built in 1851, which in its day housed the most up-to-date telescope in British North America. 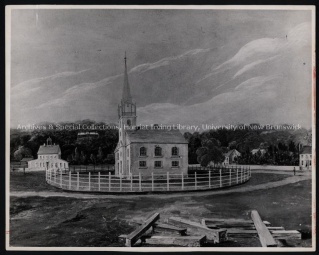 Although the draft charter had been drawn up in 1785, and although the Academy was functioning shortly afterwards (at first in a cottage on what is now University Avenue and by 1793 in its own building), the actual granting of the charter was delayed "because of the opposition of the Bishop of Nova Scotia, who looked upon the college in Fredericton as a rival of King's College which was at the same time being established in Windsor, Nova Scotia." On 12 February 1800, the Academy was transformed into the College of New Brunswick by provincial charter. The Reverend James Bisset was the first principal. The first council of the College consisted of Chief Justice Ludlow, a former judge of the Supreme Court of New York; Jonathan Odell, the Loyalist poet of the American Revolution; Edward Winslow, an illustrious founder of the Province; and Colonel Isaac Allen of the New Jersey Volunteers. Andrew Phair, one of the early teachers, served under Benedict Arnold during the Revolutionary War. The little College, which was presided over by the Reverend James Somerville after 1811, was set in a scene of pastoral beauty. In the words of a visitor in 1804, Fredericton was a pretty thing, "a village scattered on a delightful common on the richest sheep pasture I ever saw, the flocks grazing up to our door. There are altogether about a hundred and twenty houses, some very pretty, all comfortable looking, and almost everyone has a garden." The population and prosperity of New Brunswick increased rapidly. By 1823 the Province had grown sufficiently in economic and social strength to warrant the expansion of the old College; and largely as the result of the vigorous policy of Sir Howard Douglas, the older institution surrendered its charter, and King's College was established by Royal Charter. Opening the College on its new site on the hill, New Year's Day, 1829, Sir Howard sounded the note that has inspired more recent generations: "Firm may this institution ever stand and flourish—firm in the liberal constitution and Royal foundation on which I have this day instituted it—enlarging and extending its material form and all its capacity to do good, to meet the increasing demands of a rising, prosperous and intellectual people; and may it soon acquire and ever maintain a high and distinguished reputation as a place Of general learning and useful knowledge." when New Brunswick was governed by the aristocratic ideals of the Family Compact, it was natural that the College should have reflected a Tory and Anglican bias. It was, Sir Howard had said, to act as a bulwark against the leveling influences of the neighbouring republic that were so abhorred by the governing class of that day. Indeed the intellectual tone of the College was, for some time, dominated by that point of view, and it gave rise to the bitter sectarian quarrels of the mid-century, quarrels which marked one aspect of the struggle of the people for democratic self-government. The demand for religious liberty led to the abolition of religious tests in 1846. Classics, moral philosophy, logic, Hebrew, divinity and metaphysics were prominent subjects in the curriculum. Instruction became broader and increasingly "practical", as time went on, especially under the able leadership of William Brydone Jack and James Robb, who brought to New Brunswick the best scientific traditions of the great Scottish universities. While attending with great success to his professional duties, Dr. Robb did much to bring the benefits of the College to the people of the Province. He was the first scientific botanist in New Brunswick and was the first president and an active spirit of the Fredericton Atheneum, a society for the promotion of literary and scientific research. He commenced to write a history of the Province but died before it was completed. He founded the University Museum, and, throughout the course of his tireless life, contributed materially to the progress of agriculture and the exploration of the mineral resources of New Brunswick. His colleague, Joseph Marshall ("The Baron") d'Avray - a former supporter of the Bourbon monarchy of France and founder of New Brunswick's first Normal School for the training of teachers - taught modern languages for twenty-three years, from 1848 to 1871, competently and with a courtly grace. New Brunswick's change in status, from a crown colony to a province enjoying internal self-government, also had an important repercussion in the field of education. Edwin Jacob, who had served as principal for thirty years, retired in 1859, and King's College was transformed into the University of New Brunswick. Henceforth education was to be on a broader democratic basis, appealing to all creeds and classes. Under the presidency of William Brydone Jack, the University made rapid strides. Professor Montgomery-Campbell gave the students the benefit of his fine classical training, and Loring Woart Bailey, fresh from Harvard, took the chair of Chemistry and the Natural Sciences, bringing to the University the spirit that he had caught from his famous master, Louis Agassiz. For forty-six years, until his retirement in 1906, Dr. Bailey contributed greatly to the reputation of the University as a centre of scientific research. UNB President William Brydone Jack, 1878. MG L 32; Series 6; File 1, Box 4; Item 24. Dr. Brydone Jack looked forward to the extension of the curriculum to include navigation, law, medicine, engineering and agriculture. The need for instruction in navigation belongs to that vanished era when New Brunswick was a great shipbuilding and seafaring Province; but its proposed inclusion in the curriculum was evidence of the earnest attempt to make the University serve the needs of the people. Brydone Jack's aims have long since been realized to the extent that instruction in law, forestry and engineering have for years been given at the University. But progress was slow in the years immediately following Confederation, for at that time financial aid was insufficient to carry out the ideas of the President. Nevertheless, so keen was the intellectual life of the University that it achieved a reputation second only to that of the University of Toronto. It became the nucleus of a provincial culture, a fact that is attested to by the literary, scientific and political achievements of the graduates of those years—Sir George Parkin, whose fame as an a educationist was as wide as the British Commonwealth of Nations; Sir George Foster, one of the greatest of Canadian statesmen; [Bliss Carman] and [Charles G.D. Roberts], both famous poets; William Francis Ganong, distinguished scientist and historian of his native Province; and many others. Although the movement for the emancipation of women stemmed from the intellectual revolution in Europe in the eighteenth century, the Victorians were slow to grasp the possibilities of higher education for women. Although Brydone Jack had, in his encaenial address in 1870, spoken favorably of the "higher mental training of females," it was not until 1885 that women were admitted to the University. In 1889 Miss Mary K. Tibbits graduated, the first woman student to do so. 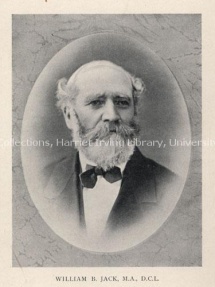 In the same year, in accordance with Brydone Jack's idea that the University should afford the training that had become necessary in an increasingly industrialized world, professors of Physics, Civil Engineering and Electrical Engineering were added to the staff during the term of office of his successor, Dr. Thomas Harrison. It remained, however, for the promise of the nineteenth century to be fulfilled in the twentieth. During the presidency of Dr. Cecil Charles Jones, from 1906-40, and his successors, Dr. Norman MacKenzie (1940-44), Dr. Milton F. Gregg, V.C. (1944-47), Dr. Albert W. Trueman (1948-53), Colin B. Mackay (1953-69), Dr. James O. Dineen (1970-72), and Dr. John M. Anderson (1973-79), the University forged steadily ahead. ural life of the Province, the Legislature has from time to time increased the provincial grant. The increased expenditure was necessary if New Brunswick was to keep abreast of the times by providing its own people with the facilities demanded by progressive democratic communities elsewhere throughout the world. The ancient Arts Building, now the oldest university building in Canada, was no longer adequate to the new need, especially as felt during the reconstruction period following the First World War. The Engineering Building had been erected in 1900. With the completion of the Memorial Building in 1925, the University was better able to serve the needs of an increasing number of students. The urgent necessity for expanding the work in Forestry and Geology was met by the construction of the Forestry and Geology Building in 1929 and by the establishment of separate Departments of Biology and Geology in 1930. At the same time the excellent Library Building, designed by President Jones, met a requirement long felt keenly by all Departments. The Library became the repository for priceless documents relating the early history of the University; and also for the Rufus Hathaway Collection of Canadian Literature. Then in 1930, as a result of the magnificent generosity of Lord Beaverbrook, who was appointed Chancellor of the University seventeen years later, the Lady Beaverbrook Residence for men, designed to accommodate fifty-five students, was completed and made ready for occupation. It would be difficult to exaggerate Lord Beaverbrook's generosity to the University for in addition to the Residence and the Beaverbrook Scholarships, he provided the Lady Beaverbrook Gymnasium and the Lady Beaverbrook Rink, which enabled the University to offer its students facilities in Physical Education. One of his greatest gifts was the Bonar Law-Bennett Library, largely organized through the efforts of Dr. Alfred G. Bailey, Honorary Librarian and Dean of Arts, which helped meet the needs of the University during the period of great expansion in the 1950s and 1960s. Although the Bonar Law-Bennett Library more than doubled the capacity and added much-needed facilities, the continued growth of the University necessitated either adding a wing to the existing library, or constructing a new library on a much larger scale. The latter course was decided upon, and the University now has the Harriet Irving Library, which has a book capacity of over one million volumes. Among the special rooms within the library are the Lord Beaverbrook Room, which contains many rare and valuable books from Lord Beaverbrook's personal collection. 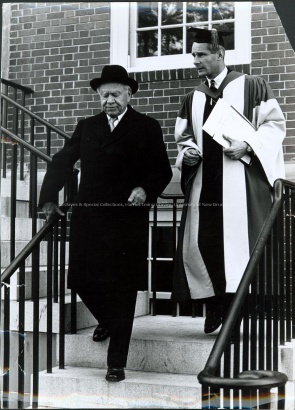 Lord Beaverbrook and UNB President Colin B. Mackay on the steps of Carleton Hall, 1954. UA PC 25; no. 28.
graduate study and research, in which this Department was a leader. Toole Hall was followed by two Arts buildings (Carleton Hall and Tilley Hall), another Science building (Bailey Hall), and by large additions to the Lady Beaverbrook Gymnasium and the Engineering building (now known as Head Hall), as students enrolled year after year in ever increasing numbers. New buildings were also erected for the Faculty of Law (Ludlow Hall), for the Faculty of Nursing (MacLaggan Hall), and for the Department of Psychology (Keirstead Hall). Both the new Law building and the additions to the Gymnasium were gifts from the Beaverbrook Canadian Foundation, and were made possible through the generosity of Sir Max Aitken, Chancellor of the University in succession to his father. A campus development program occurring from 1965-75 provided the following facilities: additions to each of three earlier science buildings; two extensions to Sir Leonard Tilley Hall; a Central Heating Plant; a Student Union Building; and an addition to the Faculty of Engineering building (Head Hall) to provide enlarged accommodations for the University's Computing Centre. The Aitken University Centre, another example of the generosity of both the Canadian Beaverbrook Foundation and the Associated Alumni and Alumnae, was opened in 1976, at the end of the academic year in which Physical Education and Recreation became a separate Faculty. An Integrated University Complex behind the Old Arts Building, which provides additional space for Physics, Forestry, a Science Library, and some administrative offices, was opened in 1977. In 1964, following the recommendations of the Royal Commission on Higher Education in New Brunswick, the University of New Brunswick entered into an agreement of federation with St. Thomas University and the latter moved to the campus of the provincial University in Fredericton. At the same time, the University Of New Brunswick in Saint John opened its doors as a two-year college of arts and sciences. Also in 1964, the New Brunswick Teachers' College (English-speaking section) was relocated to Fredericton on the University campus, and on 1 July 1973, Teachers' College was incorporated by provincial legislation into an enlarged UNB Faculty of Education. By this move the University became heir to the intellectual tradition of the Provincial Normal School, an institution whose faculty and students had played a prominent role in shaping the provincial community. It included among its distinguished graduates Viscount Bennett, Prime Minister of Canada from 1930 to 1935. The Education building has been named after Professor d'Avray, who came to Fredericton in 1848 to become first principal of the Normal School. During the 1960s the University, under President Mackay's leadership, greatly expanded its residence facilities. The Alumnae Society had equipped and developed the Maggie Jean Chestnut House as a women's residence in 1949, but as the number of female students increased, it became more and more difficult to arrange for suitable accommodation in the city. To address this need, Lady Dunn Hall was opened in January of 1963 and Mary K. Tibbits Hall - named after UNB's first female graduate - was opened in September of 1970. Meanwhile, residential accommodation for men was also greatly expanded by the building of seven houses and McConnell Hall. An interesting experiment in student housing was the opening of two cooperative residences in 1969, one co-educational and the other an apartment building. Five years later these residences came under the administration of the University; one becoming a women's residence, Edith G. McLeod House, and the other, the Fred Magee House, providing apartments for rental to married students and their families. 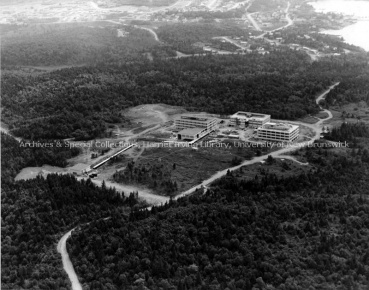 UNB Fredericton Campus, [198-]. PR; Series 2; Sub-series 4; File 917; Item 3. The need for expanded facilities became evident in the period following the Second World War with the phenomenal increase in enrolment that took place at that time. Federal grants to veteran students, the great increase in population in the Fredericton area with the establishment of Camp Gagetown, the reputation of the University as a centre of learning under the aegis of its world-famous Chancellor, Lord Beaverbrook, were among the factors contributing to this drastic enrolment increase. It was symptomatic of the University's conception of the enlargement of its own scope and purpose that the Saint John Law School, which had operated in the city since 1892, became in 1923 an integral part of the University as the Faculty of Law, now situated in Fredericton. 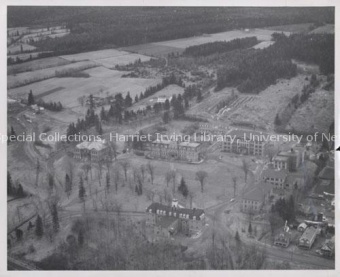 Faculties of Arts, Engineering, Forestry, and Science were set up in a reorganization of the University in 1946. The School of Graduate Studies and Research was established in 1950, followed by Faculties of Education (1969), Nursing (1973), Physical Education and Recreation (1975) and Administration (1980). The expansion of facilities for graduate studies and research provides a clear testimony to this development of the University of New Brunswick from a nineteenth-century college to a modern university. The great advocate of graduate studies in the 1950s was Dr. Frank Toole, head of the Department of Chemistry, and his policies have been carried on by his successors. Graduate study has developed in nearly all departments at the master's level, and to nearly a dozen at the doctoral level, under the general administration of the School of Graduate Studies and Research. Plans for a post-secondary institution in Saint John stem from as early as 1947, when the Saint John Board of Trade commissioned an exploratory committee of twelve members, chaired by Earnest A. Whitebone, to determine its feasibility. In 1951, UNB began offering extension courses at the Saint John High School and St. Vincent’s Convent. By the dawn of the 1960s, members of the exploratory committee began to advocate strongly for the establishment of an independent college in Saint John. It was at this time and due to this belief that the Board of Trade’s exploratory committee evolved into the College Development Corporation. During a meeting held in 1960 between UNB officials and the College Development Corporation to discuss providing financial aid, UNB President Colin B. Mackay stated his concern about the costs of establishing a college in Saint John and suggested that the time was not yet ripe to attempt such a feat. UNB had seen a rapid increase in enrollment since the end of World War II and the expenses for accommodating the growing student population were of pressing importance to university officials. After the meeting, attendee C.W. Argue – a UNB Biology professor – sent a letter to Dr. Mackay in which he suggested offering the first two years of UNB’s Arts and Science courses in Saint John – called a junior college – as a solution to the financial concern. The UNB Extension Centre moved to Beaverbrook House in September 1961, and Lord Beaverbrook, a supporter of the junior college idea, visited within days of its opening as an extension centre, ordering that the entrance sign and brass plate in the front doorway be changed to read “Junior College”. The Royal Commission on Higher Education, chaired by Dr. John J. Deutsch, released The Deutsch Report in August 1962. It stated the need for a post-secondary institution in Saint John and recommended establishing a UNB branch there. Following the release of the report, a Faculty Committee was established to study and report on how the recommendation in the Deutsch Report – opening a post-secondary institution in Saint John – could be implemented. The Faculty Committee’s report – a first look into the scope of the project – was released in April 1963, and in 1964 the University of New Brunswick in Saint John was established. The first principal, a Saint John teacher and high school principal named G. Forbes Elliot, was appointed on July 1st, 1964 and classes in first year arts and science were held at the Beaverbrook House for 98 co-educated students. Eleven other faculty members were hired for the year to teach the courses. In addition to academic classes, a Students’ Representative Council, a drama club, and a chorale had also been formed within the first year of operation. In 1963, the city legislature began to consider a bill to repurpose Tucker Park – land bequeathed to the City for the creation of a park overlooking the Kennebecasis River. The bill was approved in 1964, and on January 18, 1965, Mayor Weyman of Saint John transferred the deed for 87 acres of Tucker Park from the city to Dr. Mackay. The land was to be used to build a new campus. The sod turning for the $5.5 million complex in Tucker Park was officiated in May 1966 by Madame Vanier and Rt. Hon. Georges P. Vanier and the cornerstone laying for the campus’s first building, the Ward Chipman Library, took place in 1968. Before the campus was opened, the Old Provincial Building, the local Y.M.C.A., various high schools, and the Presbyterian Church Hall were used to hold labs, classrooms, and offices, and the second floor of the Western Tire and Auto Supply Associates store housed the university library. The campus opened officially on May 13, 1969, and consisted of the Ward Chipman Library, Sir Douglas Hazen Hall, and William Ganong Hall. Starting off the 1969-1970 academic year on the new campus, UNBSJ saw a 300% increase in enrollments since its opening year in 1964. During its first five years of establishment, UNBSJ also operated several student clubs and societies such as the Flying Club, the Drama Society and the Students’ Representative Council. The Athletics programme also continued to develop under the direction of Pete Kielty. In late 1971, a Report of the Advisory Committee on UNBSJ was released. It included a set of recommendations for the university’s growth, aimed particularly at developing four-year programs in Arts, Science, and Business Administration and creating a more independent administrative structure for UNBSJ with its own Faculty Council and Dean of Faculty. The Senate and Higher Education Commission reviewed and stated their agreement with the recommendations given. and a progressive introduction of four-year programs in Arts, Science, and Business Administration commenced in 1972. Business Administration was the first four-year program to be offered at UNBSJ in the fall semester of that year, followed by Arts and Science in 1973. In the same year, a Faculty Council was created from one of the report’s recommendations and the course types offered at UNBSJ were restructured into three divisions: Business Administration, Arts, and Sciences. In 1975, the City of Saint John developed a brief that outlined recommendations for the university to increase its autonomy. Elliot began to advocate for a separate Senate while students advocated for more courses and for a residence. The Review Committee, formed in 1974, released a report that included nineteen recommendations for UNBSJ to develop its role and scope and to improve administrative arrangements. Following these advocacies and recommendations, Elliot’s title changed in 1976 from Principal to Vice President and in the same year there commenced separate graduation ceremonies at UNBSJ. Answering students’ pleas, Beaverbrook House reopened as UNBSJ’s first residence in 1977. Also in that year the first full Bachelor of Science program was offered in Marine Biology, a program unique to the UNBSJ campus. After 1977, UNBSJ continued to gradually shift toward autonomous operations under the new vice presidency of Thomas J. Condon. 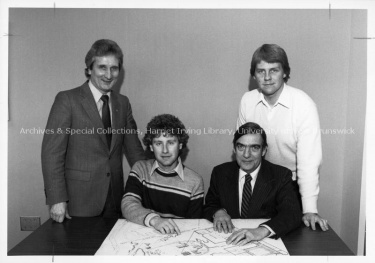 The First UNBSJ registrar, Dean of Faculty, and Faculty Secretary were all appointed in 1979 and a separate Senate was created for UNBSJ in 1986. In 1984, it was estimated that 984 students were enrolled at the Tucker Park campus. By 1988, an estimated 1,200 full-time students were enrolled with close to 90 faculty employed. To accommodate for the increased enrollment numbers, the Thomas J. Condon Student Centre was opened in 1986. Additionally, the end of the 1980s and beginning of the 1990s marks a time when the first graduate programs were introduced at UNBSJ. It also marks the shift from Academic Divisions to Academic Faculties and Departments. In 1993, the Faculty of Arts, the Faculty of Business, and the Faculty of Science, Applied Science and Engineering were established along with eight academic departments. Philip W. Oland Hall, the first academic building since the campus’s opening, was also opened in 1992, followed by Sir James Dunn Residence in 1993. Near the close of the 20thcentury, K.C. Irving Hall was opened in January 1999 to house the Nursing, Engineering, and Biology programs. The 21st century brought a sustained increase in student population and with it came an extensive development of the Tucker Park campus. After the construction of a Modern Languages Center in 2002, a large renovation of the Thomas J. Condon Student Centre was done in 2003 and the opening of the Colin B. Mackay Residence transpired shortly after that. A new Student Health Centre was also opened in 2004, and between 2005 and 2006 the Canadian Rivers Institute (CRI) was constructed as a $4.9 million extension to K.C. Irving Hall. The Bank of Nova Scotia donated their old building in Saint John to the university in 2005, which became Grand Hall, an event venue. In 1998, an Office of International Recruiting was established for both the Fredericton and Saint John campuses. The Modern Languages Centre was opened in October 2002 on Tucker Park campus and was included with the university’s celebrations of internationalization. Eight years later in 2010, it was reported that there were students from 50 countries outside Canada and that the students from those 50 countries made up 15% of UNBSJ’s student body. Kathryn Hamer, during her second year as Vice President, proposed a plan in 2006 to enhance the Tucker Park campus. These enhancements included a major renovation to the Canada Games Stadium in 2010, the construction of the New Brunswick Community College Allied Health Building in 2010-2011, an addition to the Dalhousie Medicine New Brunswick facility in 2010, and the creation of the Hans W. Klohns Commons, a renovation and extension of the Ward Chipman Library, which opened in 2011. In September 2007, the existence of UNBSJ was threatened when the province of New Brunswick submitted a report called Advantage New Brunswick. The report advocated for amalgamating a number of universities including UNBSJ into a polytechnic institute. This suggestion drove students to take action on the street and online. In January of 2008, former Premier Shawn Graham addressed the university and stated that both UNB Fredericton and UNB Saint John would continue to operate. Academic programs have also continued to develop into the 21st century, with several changes in Major and Minor offerings and in academic departments. In 2008, Dr. Hamer completed her term as Vice President and Robert MacKinnon was appointed as her successor. He was reappointed in 2013 for a second term as Vice President. See also: Cecil C. Jones' account of UNB in Historical Foreword (1933). Adapted from Alfred G. Bailey's "Historical Sketch". UNB Calendar, 1985-86. Bailey, Alfred G. "Early Foundations, 1783-1829." The University of New Brunswick Memorial Volume. Ed. Alfred G. Bailey. 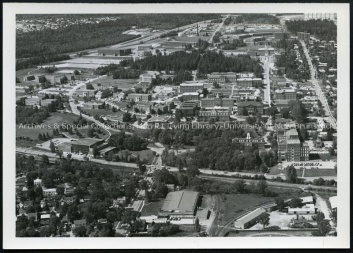 Fredericton: University of New Brunswick, 1950. UA Case 180; Section 4; File 1. University Perspectives: Special Edition: The Deutsch Report. Vol. 2, no. 4, 16 October 1975. Montague, Susan. A Pictorial History of the University of New Brunswick. University of New Brunswick, 1992, p. 197-217. Goss, David. Saint John Curiosities: Stories and Histories. Halifax: Nimbus Pub., 2008. This page was last modified on 8 January 2016, at 15:01.